My love affair with hair jewels began quite a long time ago- at a science fiction convention in Kentucky. There was a woman selling hairsticks in the huxter room. I don’t remember her name but she was vivacious and jovial, dressed in bright colours like an exotic bird and she wore her own bejeweled hairsticks in her masses of chestnut hair. Her displays were are creative as she was- beautiful bowls full of rice bristling with jewels of every colour. The year was about 1985, as I recall and, having researched it, I am pretty sure they were Mei Fa sticks. I bought two pairs of beautiful sticks- one in blue and one in lavender- and I have no idea where they are now. I wish I did! She also had a carved jade set that was asymmetrical- one large flower and one simple slender bead. I could in no way afford it but I have never forgotten them. Later- at a very bad and poor time in my life- I made myself another pair from chopsticks with a pocket knife and sandpaper. They were not ornamented and had a simple ball of wood above the main stick. I don’t know where those are now either. Perhaps I gave them all away when I cut all my hair off. Foolish wren! As my hair began to get longer, I began to think about getting another pair of hairsticks. 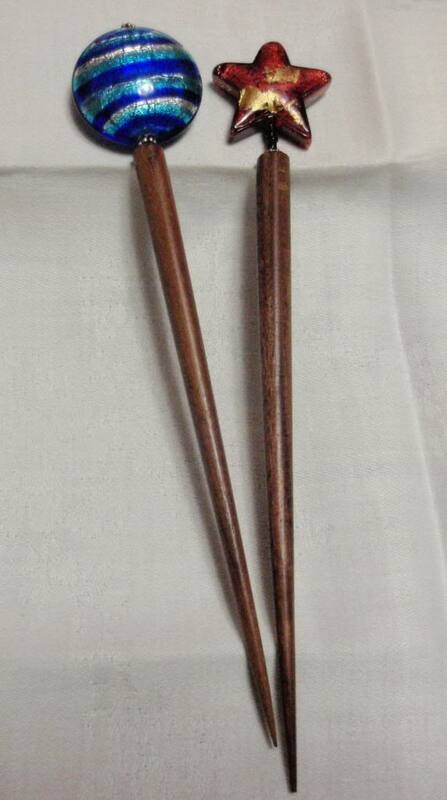 I got a pair of simple wooden sticks that might as well have been chopsticks for all the shape they had and then I ordered a pair with jade balls to match my jade jewelry from ebay. 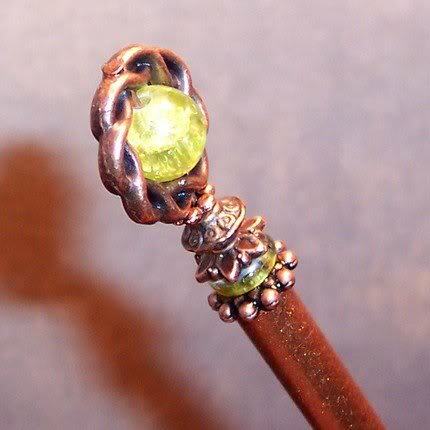 Amusingly, I rarely wear my jade jewelry… but I wear those poor hairsticks almost every day now. Since I currently have a job that hair jewelry is about the only jewelry I can wear (it’s not prohibited, it just gets in my way) and since I have discovered Etsy and the huge range of beautiful hairsticks, I have garnered a bit of a collection. For my own purposes and because I am just that type of person, I want to catalog them here. 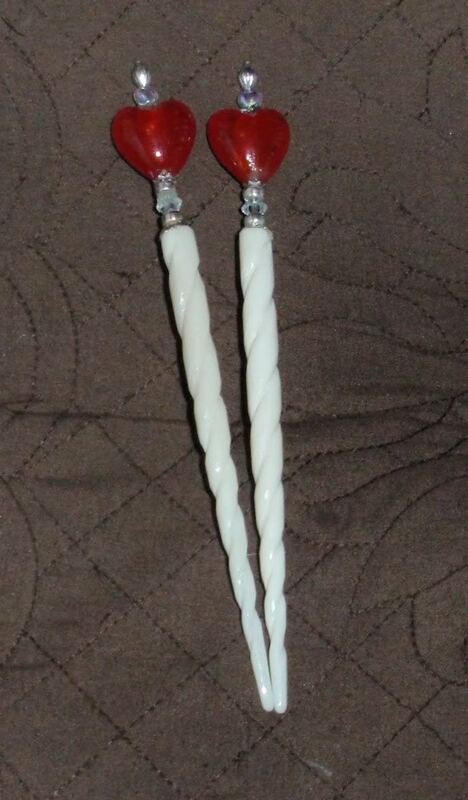 The first set is, of course the jade hairsticks I bought on ebay. They are made of carved spiral bone and dyed black, crowned with green jade balls and silver findings. This is the name I gave to the sticks I got before I discovered that more than one person made decent hairsticks! By Nightblooming I’ll let her tell you about them! (By the way, she does custom orders too and is really nice about it.) I had this on my wish list and my Switch Witch got it for me. Way to go, Superwitch! I still love it to pieces. Our Celtic ancestors believed in a Gate between two worlds, neither side of the Gate was the “right” or most important, or permanent one. At any given time, a particular spirit could be dwelling on the mortal side, or the non-mortal side. Continuous flow between the worlds, in terms of gifts and life-energy and the passage of beings, was the way in which the ancient Celts envisioned the universe. At Samhain, as the veil grows thin; there is the spirits, the deities of land and water and growth, and the shining ones above, growing closer and closer, until, for a few days, the Gate stands open and there is a strong sense of communication between the Other and the living. At Beltain, the power of new life like living flame rising up in every organic being—people, trees, animals—as that power flows back into the mortal world. 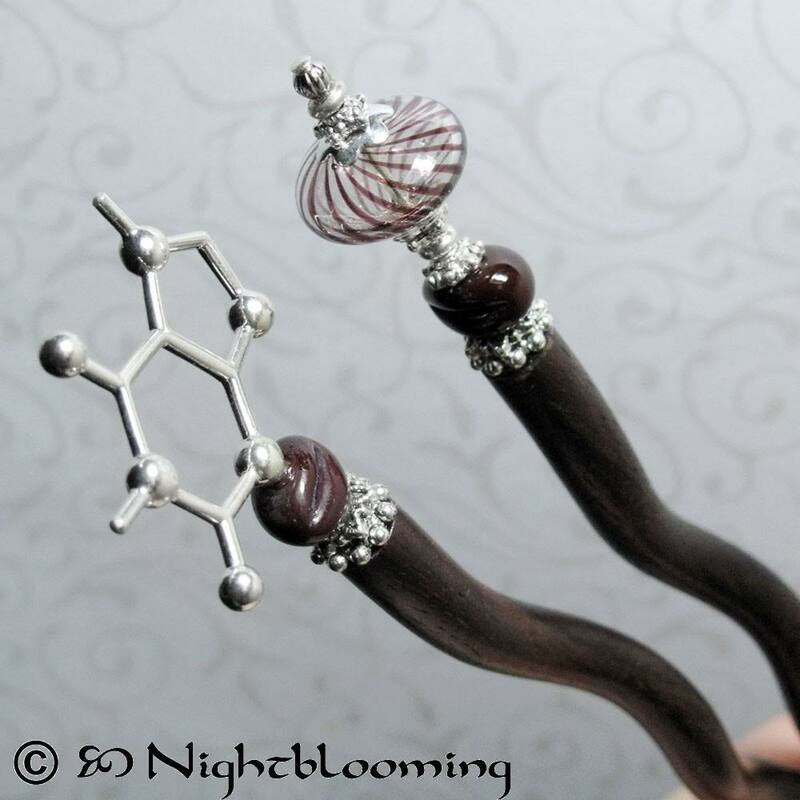 This stick may just help the wearer gaze into both worlds at the same time. 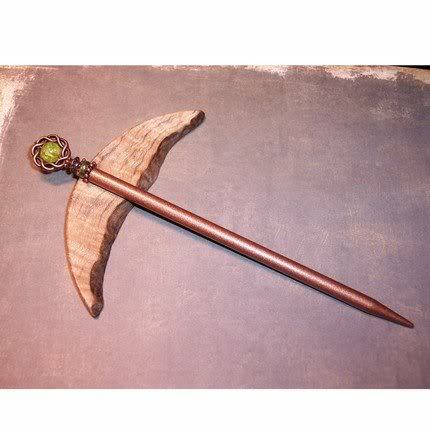 Built upon copper-colored aluminum, this stick is topped with pounded antiqued copper-colored pewter that holds a disc of brilliant peridot green glass. 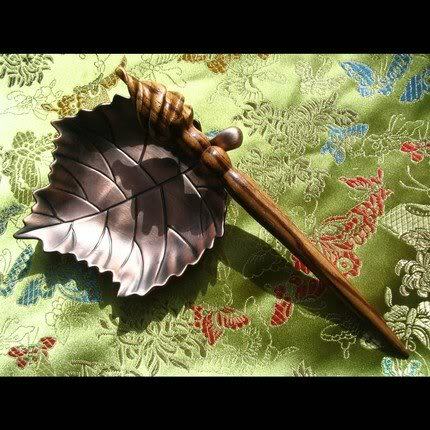 Capped with leafwork metal and fluting upwards with more copper, a copper gate crowns this stick. The gate holds a glittering heat-crackled glass orb, symbolic of the portal between the Worlds. This stick has a usable length of 5.25 inches and an overall length of 6.25 inches. The aluminum sticks are hollow, making them very strong and very lightweight. They can be used in wet hair, oiled hair, and are perfect for thick hair that’s prone to breaking wood or plastic sticks. Another stick by Nightblooming. How could I resist it? Rivendell has often served its purpose as place of rest, council and help. From the ridge there is the voice of hurrying water in a rocky bed at the bottom; the scent of autumn leaves in the air; and there is a light on the valley-side across the water. In dusk, the path down the Rivendells winds slowly, the air growing warmer as the trail slopes lower into the valley. The trees change from beech and oak, and there is a comfortable feeling in the twilight. Rivendell is an Elven outpost in Middle-earth, a fictional realm created by J. R. R. Tolkien. It was established and ruled by Elrond in the Second Age of Middle-earth (four or five thousand years before the events of The Lord of the Rings). Rivendell is a direct translation or calque of the Sindarin name Imladris, both meaning “deep valley of the cleft”. These sticks pay homage to this amazing place, caught in the colors of autumn. Built upon beautiful twisted hazelnut ketylo, this stick is topped with a honey-colored heat-crackled bead, whose internal facets dance as the light shifts over it. 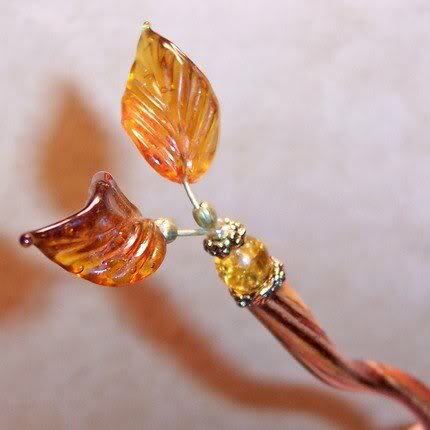 Floral brass accents twist upwards to the crown of the stick, a pair of twisted amber glass leaves. Amazing in detail and as lightweight as a breeze, this pair is like a bit of Middle Earth caught in your hair. Dymondwood is a very strong and waterproof wood that has been impregnated with dyes to create rich natural or vivid colors, and resins to provide strength and durability. It is moisture resistant and can be used in damp hair, while the twisted shape provides a locking, comfortable hold. The stick has an overall length of 6.5 inches and a usable length of 4.75 inches. A custom set by Nightblooming. Samhain, the night when the veil between the worlds is the thinnest, and magick strong. It is a celebration of death and of the dead, and it often involves paying respect to ancestors, family members, elders of the faith, friends, pets and other loved ones who have died. The spirits of the departed are invited to attend this festival of darkness and death. 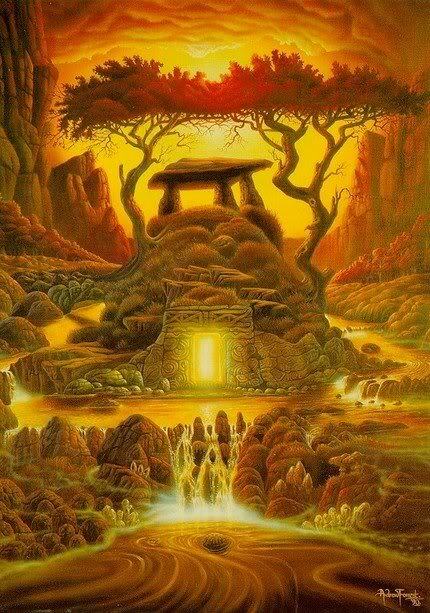 and the sunset portal close. we part for just awhile. 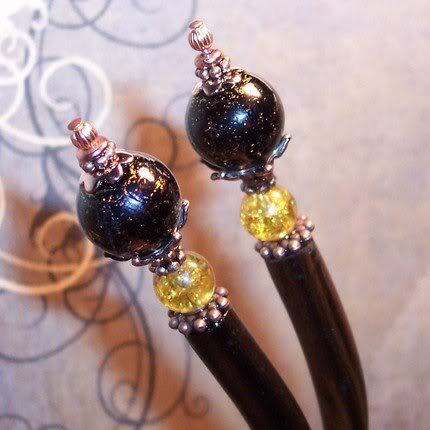 Built upon a Ketylo Madagascar Ebony sticks as dark as midnight wood, this pair is topped with glimmering Dichroic glass beads- deepest black with sprays of autumn shimmers of gold, ocher, oranges and yellows. Supported by heat crackled amber glass and accented with tarnished copper, this pair embodies the Witch’s New Year. The pair has an overall length of 7 inches and a usable length of 5.75 inches. Because I wanted something a little more recognizably Halloween, I made these myself. Witch custom made for me by Deanna Chase of CDLampwork, ceramic pumpkin built on spiral bone sticks dyed black. 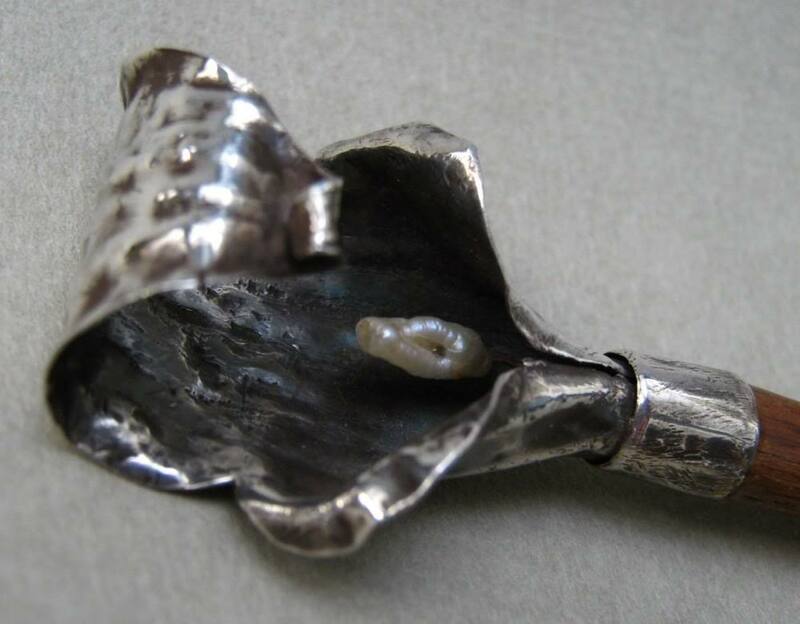 Hand-forged, hand fabricated, this Jack in the Pulpit flower is made of sterling silver with a long, thin freshwater pearl set in the center as its pistil. The details of flower hood are enhanced with liver-of-sulphur oxidation. 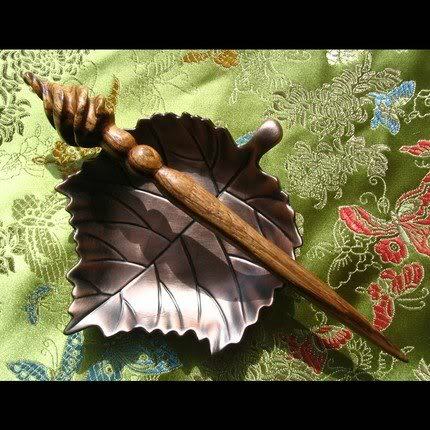 The flower is tightly glued to a wooden stick, hand-turned by an old friend of mine who made furniture. Sorry, I do not recall what type of wood it is, but it is fine grained and very pretty! 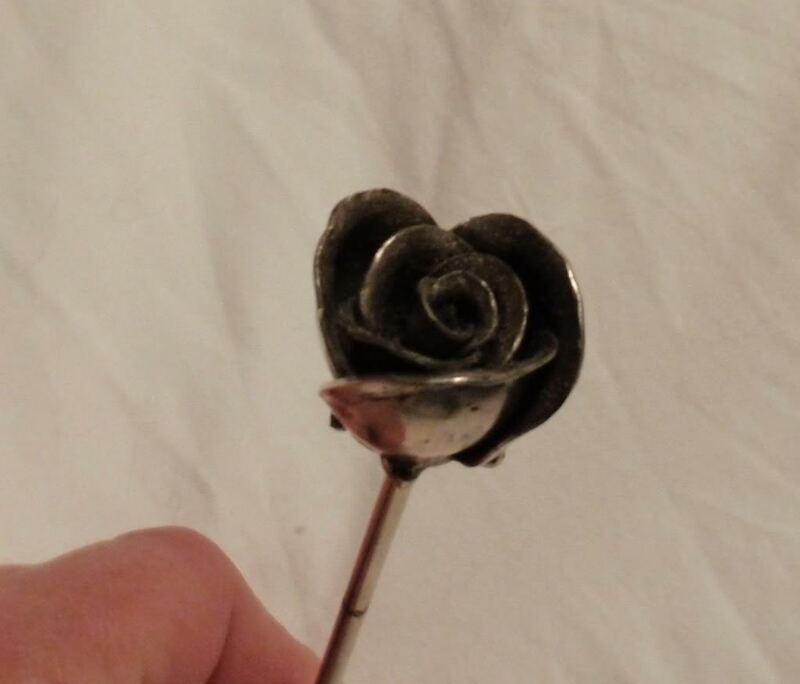 This stick measures approximately 6″ long, and the flower itself measures approximately 1 1/4″ not including the silver band at the bottom. 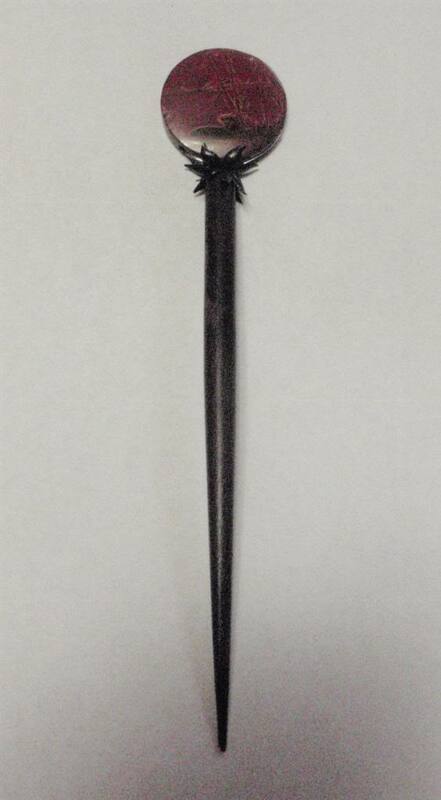 This Turkish style twist hair stick is made from Zebrawood, and measures 6 1/4″. The Zebrawood I used for this hair stick has wonderfully blended stripes of brown. The twist is sculpted by hand and has been carved into a turkish style top. Absolutely a one-of-a-kind design. 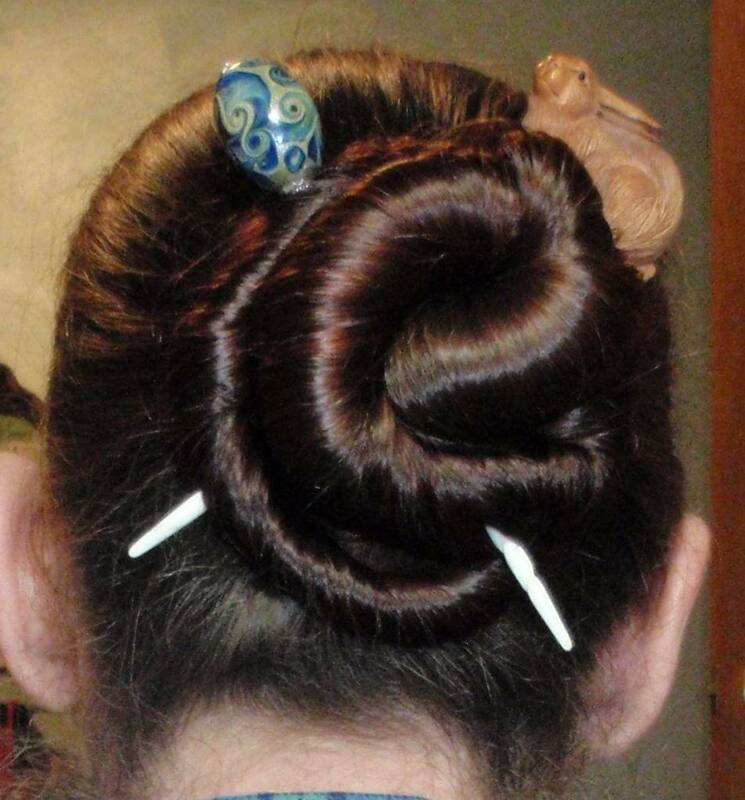 Brandywine hair sticks are designed to hold well in many styles of hair twists and buns. Zerbawood is a heavy hard wood with a somewhat coarse texture, with the typical so-called zebra stripes, often with an interlocked or wavy grain. The heartwood is a pale golden yellow, distinct from the very pale colour of the sapwood and features narrow streaks of dark brown to black. Zebrawood can also be a pale brown with regular or irregular marks of dark brown in varying widths. Our artwork is handcrafted, and never duplicated so each piece is unique. Our materials are organic, and we take great care in keeping our workshop natural, providing for good health and conscience for everyone. We endeavor to produce art without chemicals, using natural oils to preserve the wood. These oils will give the art a satin finish, adding to the overall lustre and attractive nature of the wood. This is another set made by me. I got the idea and then had to hunt up the materials to fulfill it. Each openwork cap is designed with bubbles (circles) and granules (raised dots). Each cap measures a substantial 16mm (5/8″) in diameter and about 8mm (5/16″) in depth. The vermeil on these beads is 24K gold over 925 Sterling silver. The vermeil meets FTC standards of 100 millionths of an inch of fine gold layered over sterling silver. These exquisite Bali beads are imported by me directly from Bali Indonesia. Each bead may exhibit slight variations because they are handmade by Balinese silver crafters. The moon is carved bone that I bought from Ebay. 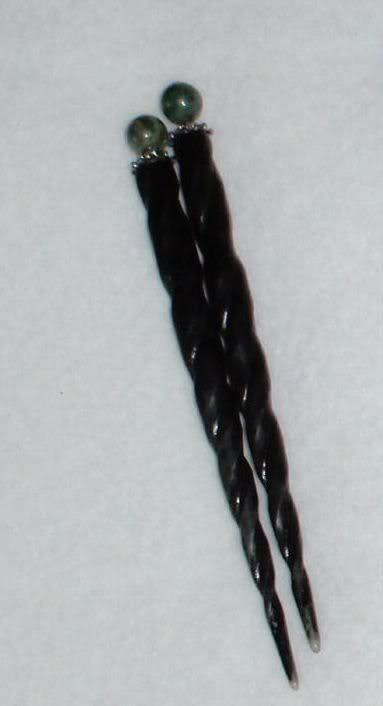 Built on dyed black spiral bone sticks. 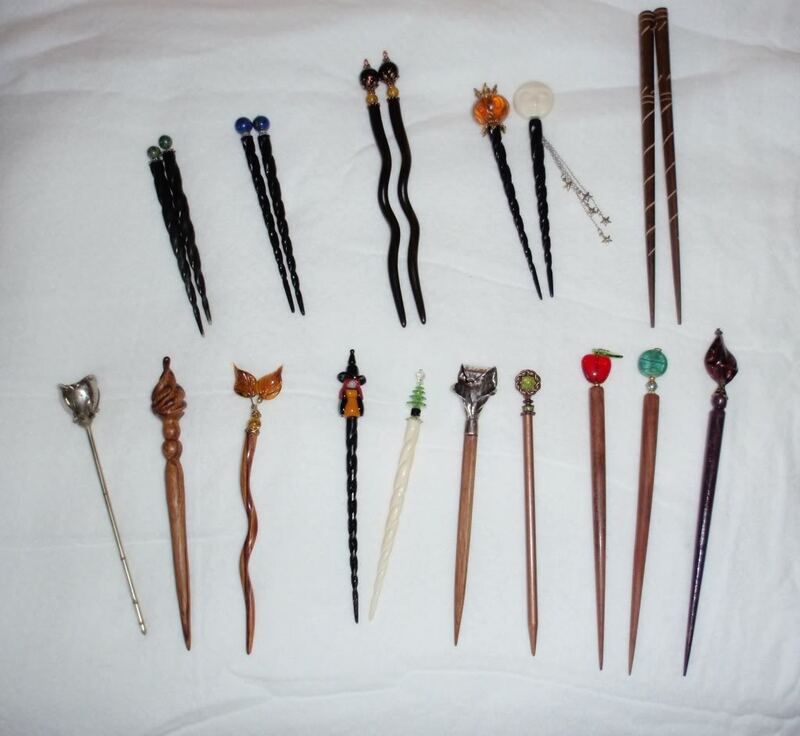 If I have hairsticks for Halloween, I should have some for Christmas, yes? Size 6 to 12 mm “margarita” or Swarovski 3700 article cut AB crystals stack up on each other and are topped with an adorable star shaped iridescent bead (1/4 inch). The base is a 4mm topaz crystal cube and a silver bead cap. Built on a white bone spiral stick. Built on a white bone spiral stick, this is the companion hairstick to the Christmas tree. It has a matching silver bead cap topped with a crystal 6mm Swarovski bicone and a 20mm Swarovski Snowflake. It looks a little yellow in the picture but it’s clear as ice should be. In Arthurian legend, the mythical isle of Avalon’s name is believed to mean ‘isle of apples’. Apples appear in many religious traditions, often as a mystical and fruit. Most of what I know refers to golden apples,however, the kiss of in Snow White was a juicy red apple. One of the problems identifying apples in religion, mythology and folktales is that the word “apple” was used as a generic term for all fruit, other than berries but including nuts, as late as the 1600s.folklore. When winter comes the hummingbirds are gone. Where do they go? Maybe off to the enchanted emerald isle only to be back next spring when the tender leaf of new life bloom anew again. 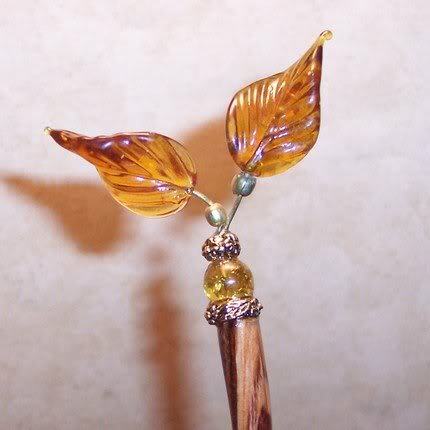 This hair stick has a glass emerald lentil bead with a brass hummingbird fluttering overhead. The light green pearl beneath is made by Swarovski and is crystal. The bead and Gold filigree caps are gold plated. 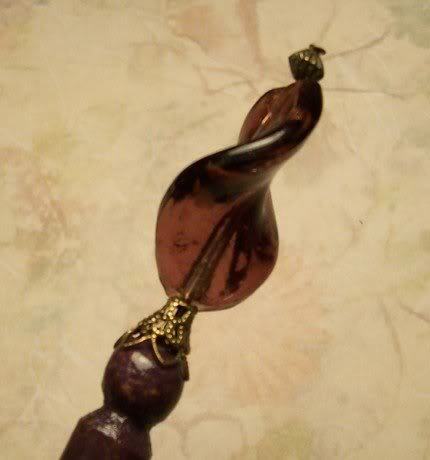 At the tip of this hair stick is a beautiful Italian style twisted glass bead with swirls of bronze and Plum. 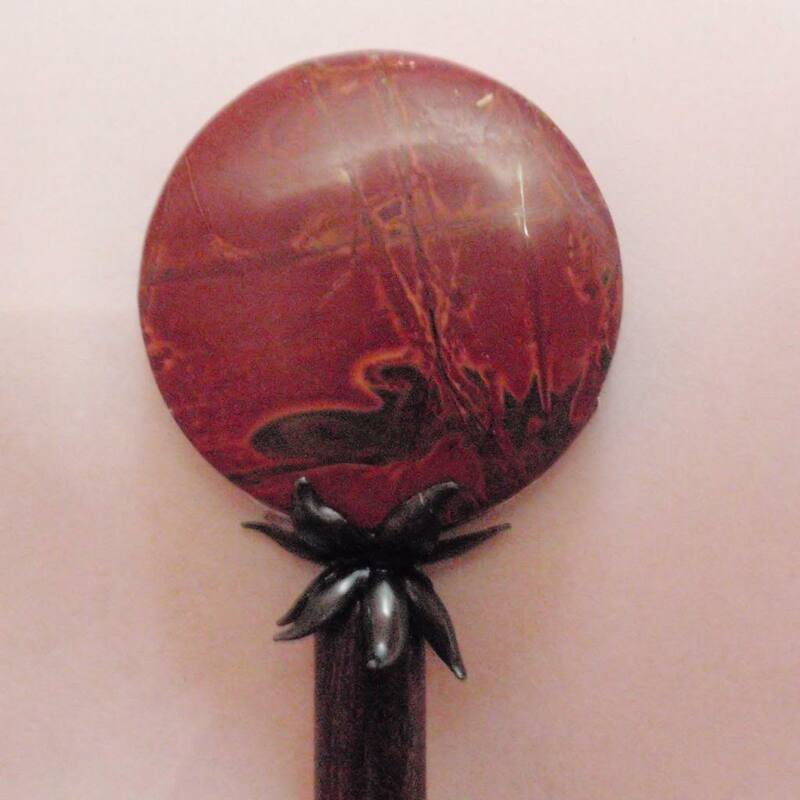 The wooden hair stick has been hand painted in a custom shade of plum with a shimmery finish. 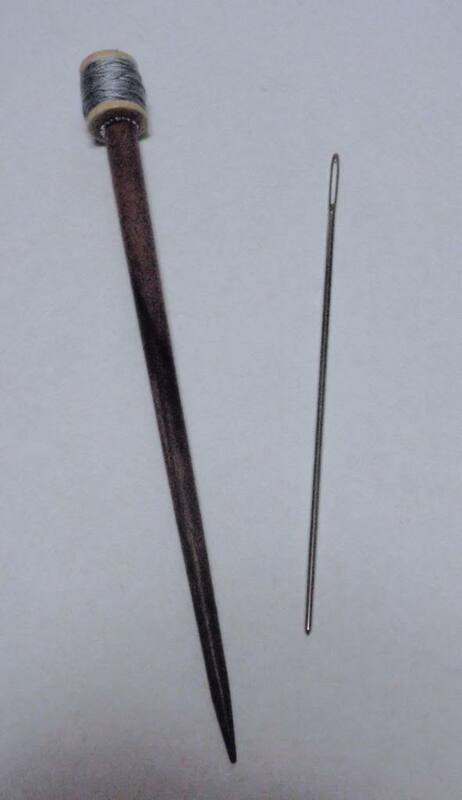 The overall stick measures 7 1/4″ with 6″ of usable hair stick. This is another custom piece. I bought it at a Renaissance Fair- the man was making a gold one and I asked if he could make me one in silver. He did and half an hour later I came back and collected it. Vintage lapis lazuli gorgeous GRADE A beads that are TOP quality material! These beads measure approx. 11.5 mm and price is for these 2 beads. I 100% guarantee these beads to be NATURAL vintage untreated A Grade lapis beads that we purchased in the Far East in 1985. I made these because I needed a pair to wear with blue jeans. Silver accents and black spiral bone sticks. Another custom set by Nightblooming. The discovery of coffee is sometimes ascribed to goats. Coptic monks, who are compelled to observe a strict religious order of overnight prayers, notice that goats that had nibbled the leaves and fruit of wild coffee shrubs became excited and could not sleep at night. Thus, the monks follow the goats and, although they do not really like the taste of the leaves and bean, they are greatly satisfied with their unusual effect. This pair, decorated in in homage to this most favoured beverage, may just give you a bit of a boost. Built upon east indies ketylo rosewood, this hair pair is topped with a double row of silver pewter and a coffee-bean shaped glass bead. 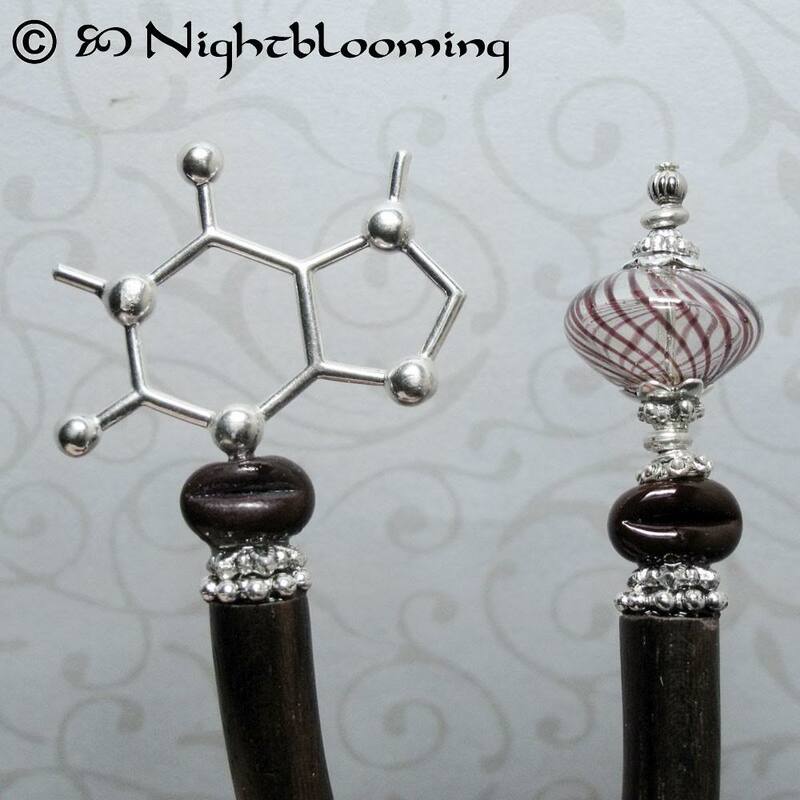 Sprouting from the top of one is a caffeine molecule from molecularmuse, a spiraling orb of blown glass on the other. The pair has an overall length of 6 inches and a usable length of 4.75 inches. 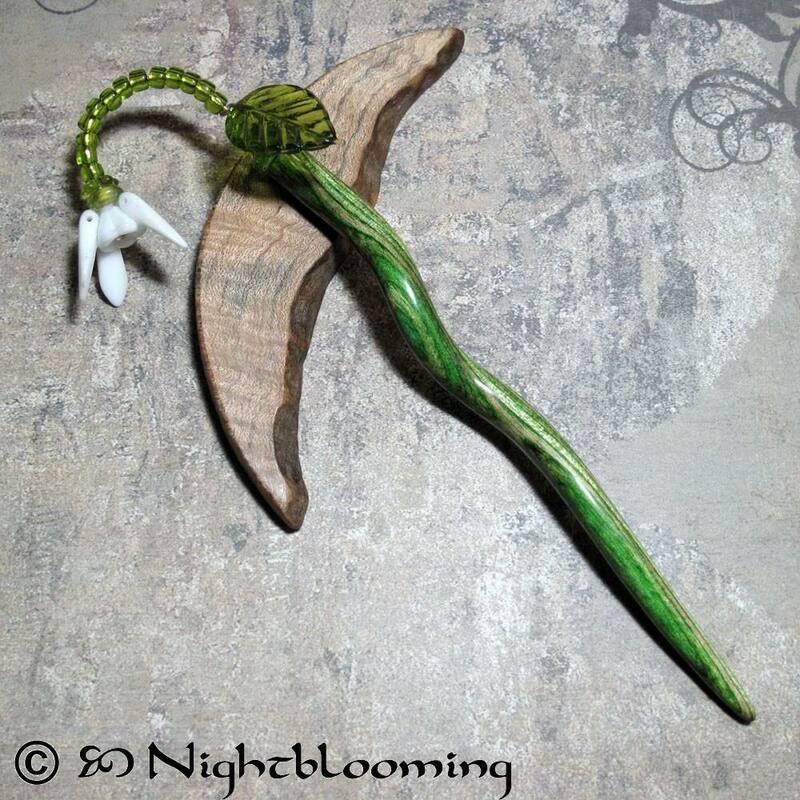 Another custom stick by Nightblooming. 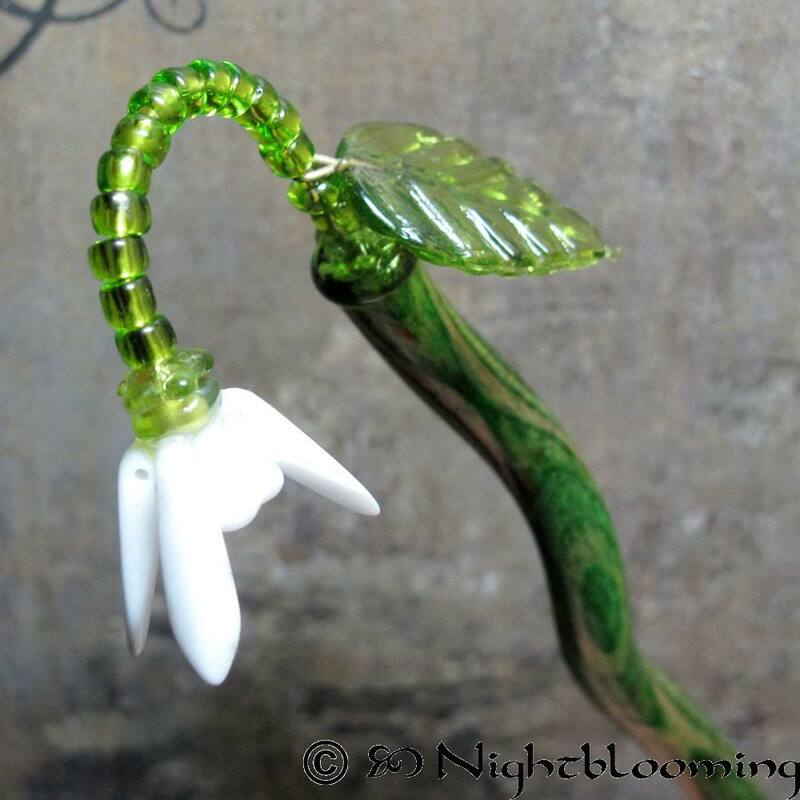 In Neil Gaiman’s novel Stardust, Dunstan Thorn and subsequently his son Tristran carry a glass snowdrop that chimes when held. The flower has a very small, but pivitol role in the story. When Dunstan crosses over the Wall and into Stormhold he finds a market, and a booth wherein a woman is selling glass flowers. “No? What will you take?” For by now he was quite agitated, and his only mission was to obtain a flower for … for Daisy, Daisy Hempstock … to obtain his flower and to depart, for, truth to tell, the young lady was making him exceedingly uncomfortable. “That I’ll pay with goodwill!” said Dunstan, and with that he leaned across the stall, amid the twinkling jingling of the crystal flowers, and planted a chaste kiss on her soft cheek. This diminutive flower could have been the one plucked from that very same stall. 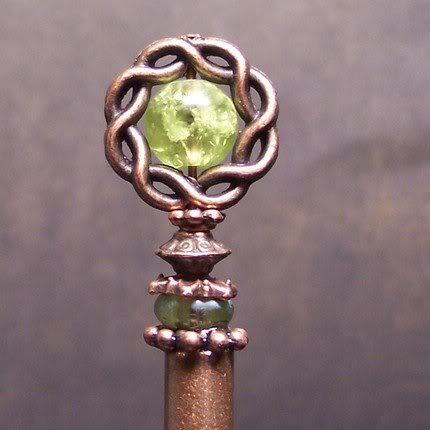 Built upon a Ketylo Tahitian Jadewood dymondwood stick which acts as a stem, this tiny work of art is crowned by a peridot green leaf and a vine of green glass beads. 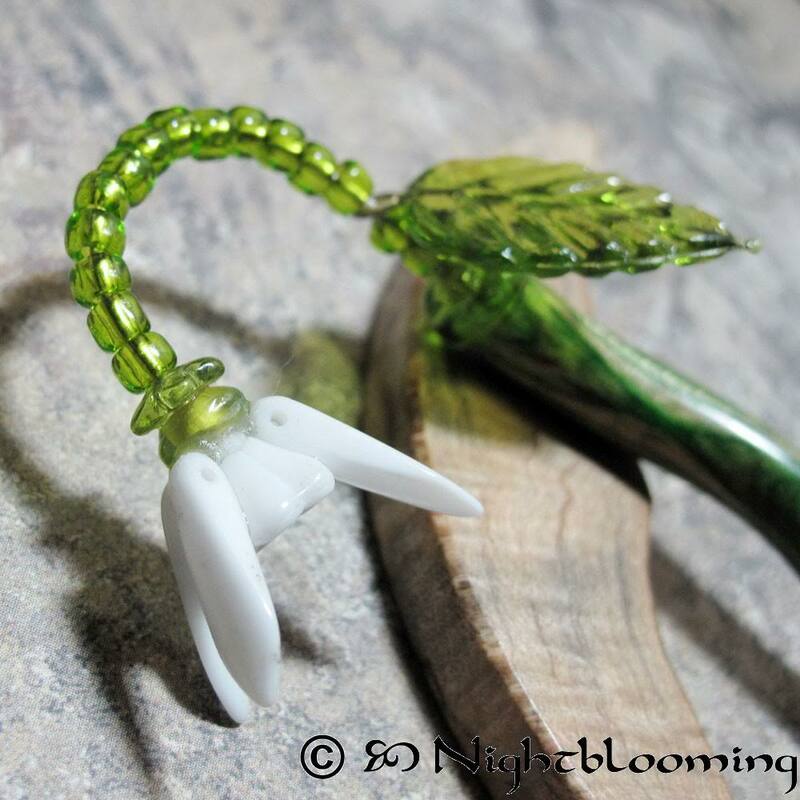 Most glorious of all, however, is the nodding head of the snowdrop flower itself, built from pressed Czech glass and epoxied together. This stick has an overall length of 6 inches and a usable length of 4.75 inches. 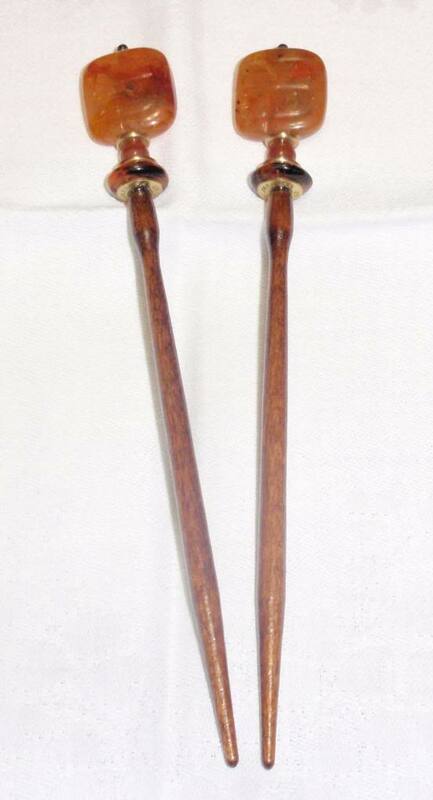 The Oriental pair is cloisonné fans and oblong beads spaced with gold and red jeweled rondelles on black lacquered wood sticks. Lampwork Puffed Red Hearts with Silver & Gold Foil Art Glass Focal. Gorgeous beads one of a kind find! Built on spiral white bone sticks. 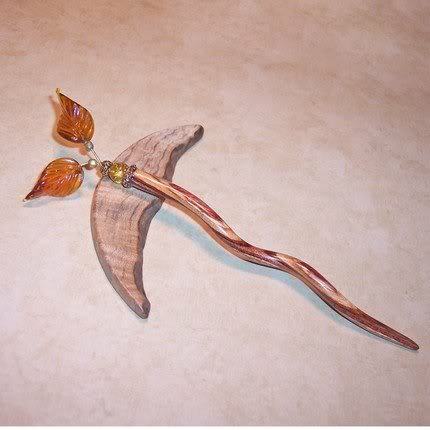 This is a whimsical broomstick hair stick made for Gretchen for the upcoming Halloween season. 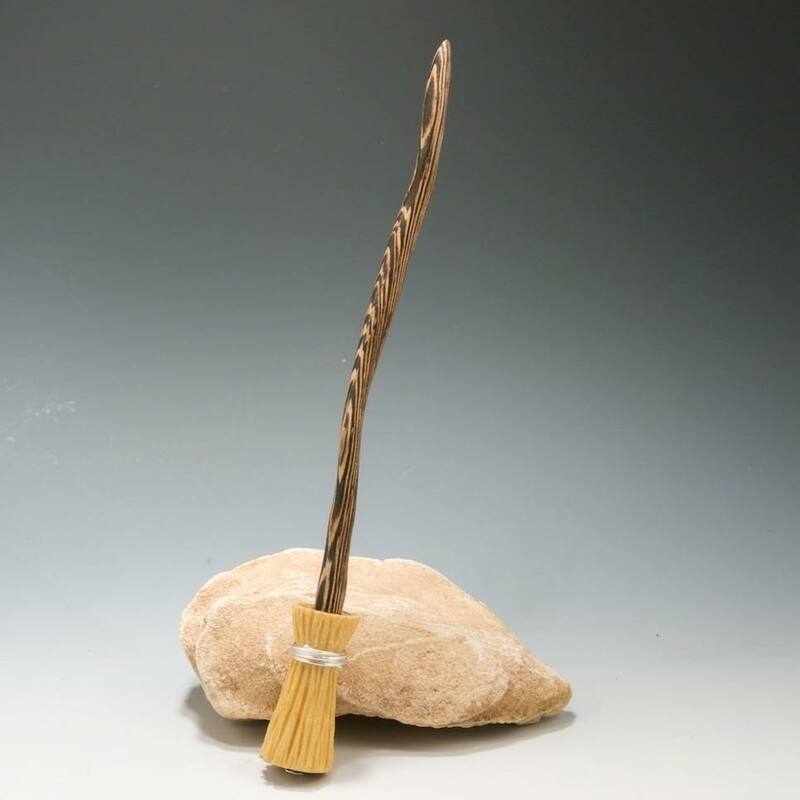 It is entirely made from wood with a bleached wenge handle and a carved yellowheart broom “bound” with a sterling silver wire. The two pieces are attached with a sterling silver nail embossed with our logo. The handle is about 6 inches, 153 mm, long and the piece measures about 7.5 inches, 195 mm, in length overall. In other words, it’s bigger than I thought it would be! It’s a great piece though and I’m looking forward to wearing it. These are one of the pairs I decided to replace my lost Mei Fas with. I just love the brown tones- brown is highly underrated! I thought about trying to replace the actual sticks and decided that I’m not even the same person I was in my 20s and the sticks I want to wear on a daily basis aren’t the same either. This is the second set of Mei Fa sticks I got as a replacement. A good daily set. A smooth wooden hairstick, topped with a large, beautiful star-shaped Venetian Murano glass bead in shimmering red and gold. It is a hand made work of art by Skaramouche, an artist here on Etsy. 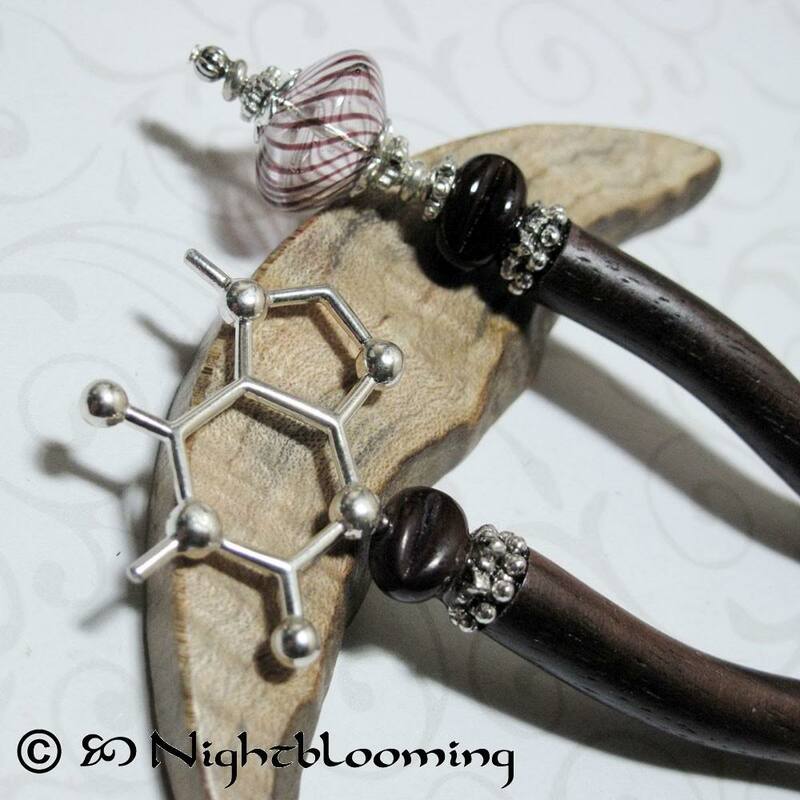 Paired with another smooth wooden hairstick, topped with a large lampwork bead in different shades of blue and cyan. 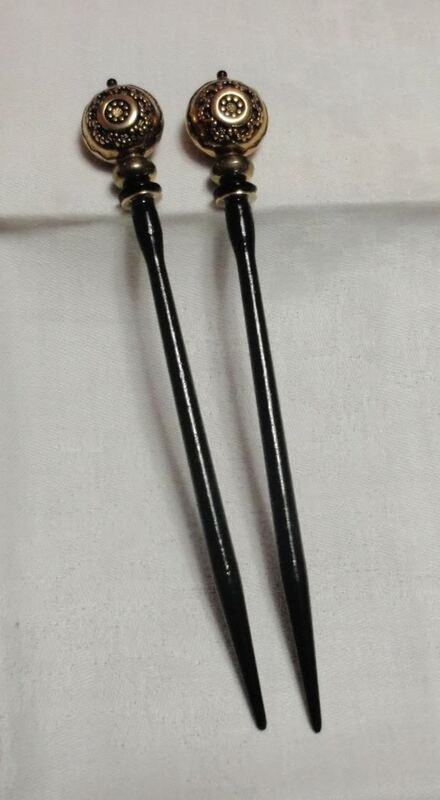 As the beads are quite heavy, these hairsticks fit only women with especially thick or long hair (or both). Egg by finntastic2006: This very large lampwork focal is stunning, it has a little bit of dichroic in a mauve/pink and is blue/green with gold accents. It is egg shaped and measures about 1 1/4″ by 1″. I got these on ebay and I’m not really happy with the execution of the idea. The idea is great- the craftsmanship is lacking. I also got this one from Ebay- and the craftsmanship is amazing! 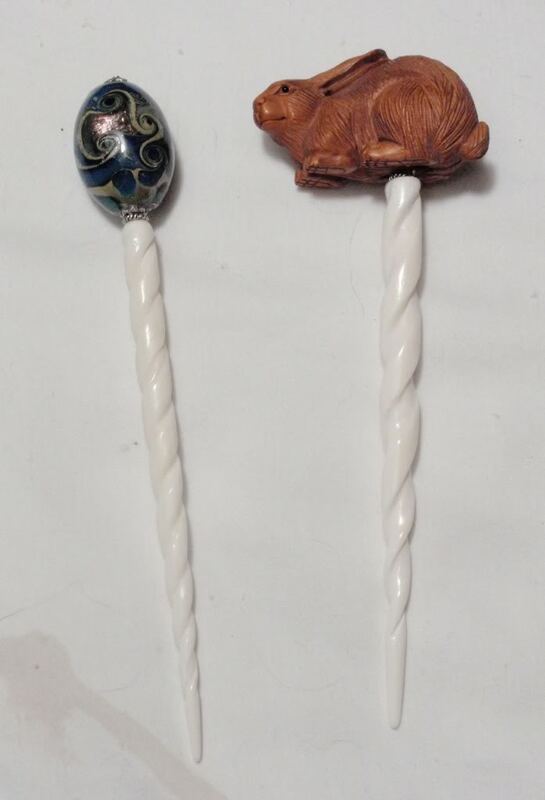 A unique and unusual hair stick for your beautiful hair. The otter is actually a piece of cherry picture jasper that I bought from fabricdragon (correct me on the stone if I got it wrong please!) and some base metal bead caps on a rosewood stick. The sewing hairsticks are actually the largest needle that I could find, a rosewood stick, and the smallest wood spool I could find with some blue silk thread wound on it. I found this at Earthbalance in the mall- it looks like something a hobbit would wear… and at that price, it was irresistible! Do you sell the glass blown hair sticks somewhere? My daughter loves them and we are havig difficulty finding any. Thanks! 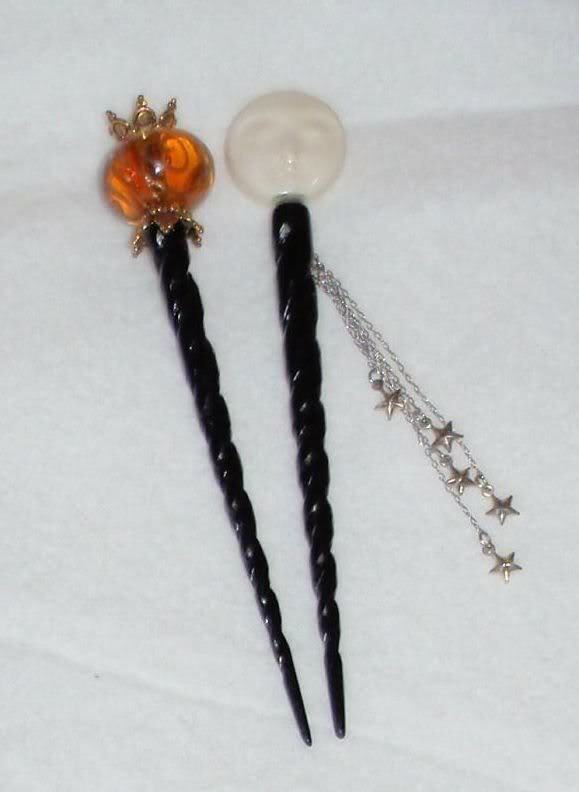 I don’t actually sell hairsticks, just love them and wear them. 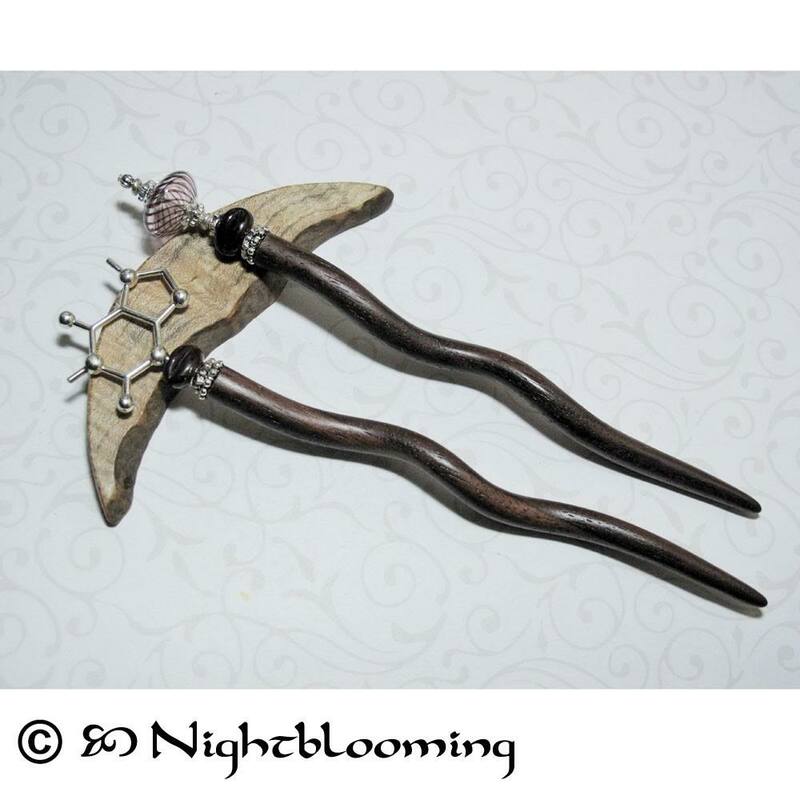 The best place I have found for a variety is Etsy (www.etsy.com) I’m especially fond of the ones by NightBlooming. Look through her sold sticks because she does make them to order.